Join Hump Day $50 Giveaway This Week: Add Us to Your Google+ Circles! On the first mandatory entry, please do not forget to write Pensive Thoughts referred you since it is a mandatory entry. You must complete the first 2 tasks before the others are enabled, and for all your other entries to count. This entry was posted in Google+, Hump Day $50 Giveaway. Bookmark the permalink. 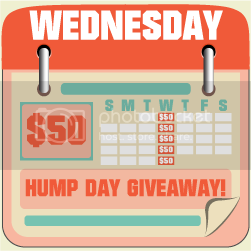 6 Responses to Join Hump Day $50 Giveaway This Week: Add Us to Your Google+ Circles! The problem is already fixed, Maye! Thanks for letting me know about it. good luck to the winners, whoever it is, surely will make them happy 🙂 Visiting from Happiness Is Sis, hope that you can return the visit too. ← Lucky Winner of Pensive Thoughts’ Rashfree Giveaway!